Setup and adjust correct and accurate DHLA40, DHLA45, DHLA48 C,D,E,F,G,H,L,M,P,R,S,T emission and non emission fuel levels and float levels. First we need to understand there are 3 types of float. They all look similar! They all need to be catered for in their own setting. 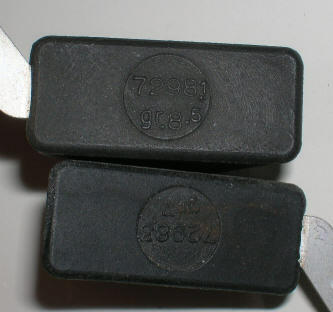 Below shows the 7 and 8.5gram floats which became the "norm" for all carbs after about 1972. These 7 and 8.5gram are similar in setting, but the 10gram needs a different setting. I prefer the heavy EARLY 10gram float for some reason, more constant fuel level and running in my opinion. I always fit these to my carbs set at 17.5mm initial setting or 18mm using SUPERIOR Viton Tipped needle valves. 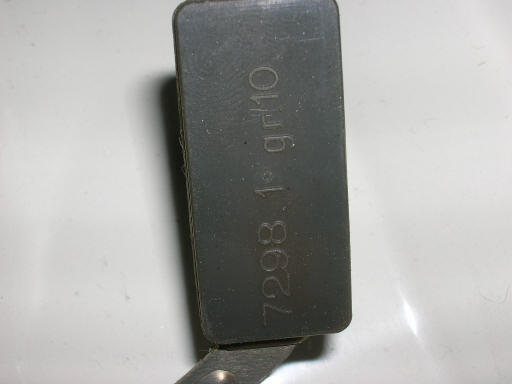 Either the weight or the float part number should be engraved on the float. 3 types the 7g, 8.5g and 10.0g floats. 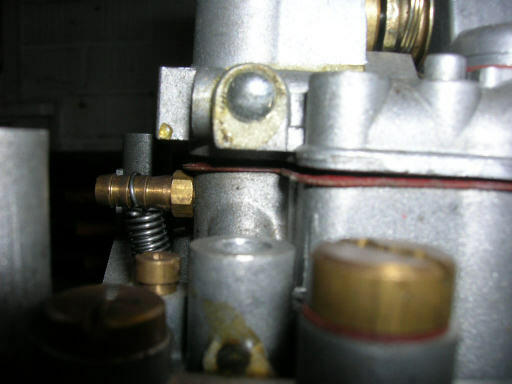 Above and below images show the needle valve has a spring inside. ALL static adjustments to float heights MUST be done with the lever tab on the float touching the rounded tip on the needle valve shaft, but NOT compressing the spring at all when the measurement is taken. Below shows the distance A, which depending on the float used 7,8.5 or 10gram and will be initially set to the figures quoted above. Fit the new valves and assemble the float and cover (with gasket!). 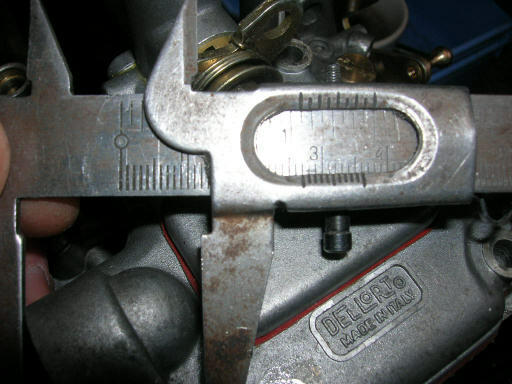 Set your calipers to the figure quote and to work with your float weight, check they are accurate with a ruler or micrometer and proceed to tweak the float, if needed, this is to obtain the correct figure at the floats furthest extremity (A) from the needle valve. As shown below in other images, to adjust the float level tweak the floats. As seen below. It helps to hold the carb top vertically or just off vertical unless you are an octopus. 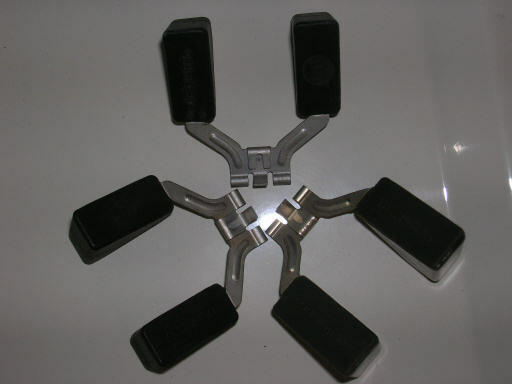 This is so the float tab rests naturally against the needle valves rounded tip. This MUST be done with the top plate gasket in place. Most people just finish here and call that setup. This is just stupid, as it often does not translate into a good fuel level in the carb. Depending on if metal or viton tipped needle valved are used and also the valve body can be No1 or No2, floats may have been "butchered" by previous "engineers". So this is where my technique starts. I use the above info ONLY for reference and initial setup to start off the correct adjustment. 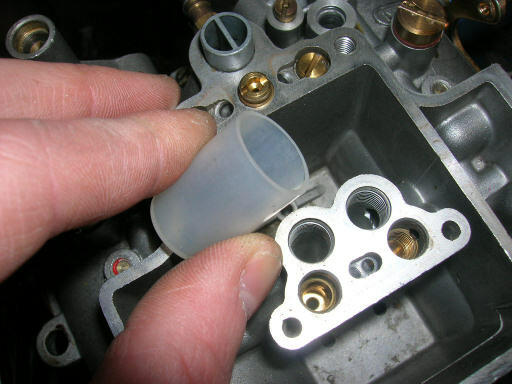 After the above is done, if the carburettors are not bolted to the car, fit them now, but do not fit the top linkage or filters, as you will be removing the float covers and floats and will need to look down the barrels for leaking. Before adding the fuel pipes to the carbs test the fuel pressure first. Set at 3psi if using metal valves and up to 5psi if using viton. Its important to do this on the car, as different fitments/manifolds give a different "angle" or rake to the carb, the main-jet stack must be supplied with a proper fuel level. Firstly remove two of the top plate cover screws, so each top plate (float cover) is being held down with only two screws. The choke plunger will spring the top plate upwards with no screws in place, so giving a poor reading and leakage if you allow this to happen at any time during this calibration. Its VERY important to keep the float cover sat firmly on the carb at all times when setting the "fuel bowl levels" ~ to the all important setting so often ignored through ignorance or naivity. Below shows where the top needs to be while the pump is filling, down on the mating surface, also it needs to be here all the time, till you quickly WHIP it off to check the fuel level. 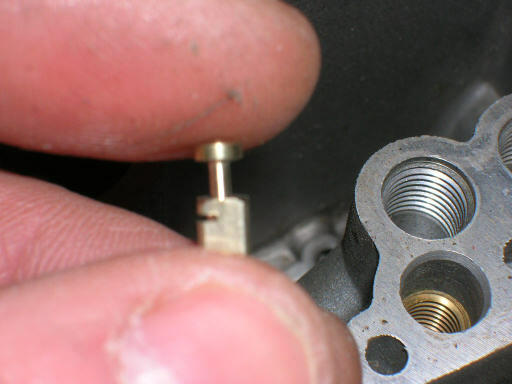 The gasket needs to be under compression too. 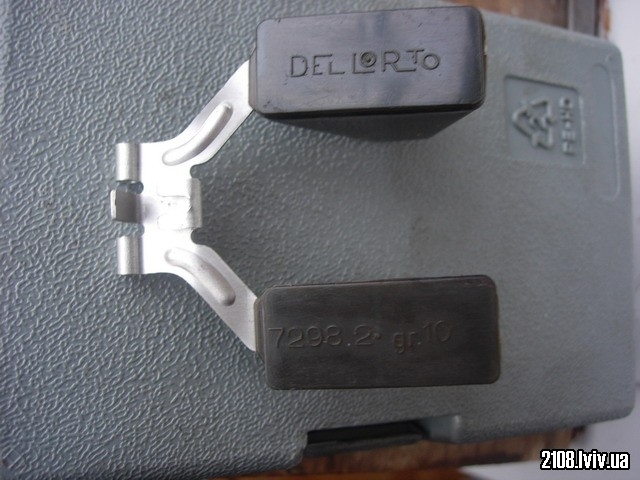 Get your caliper and set to 27mm!!!!!!!! check the pointy end you will be using is actually set to 27mm in length with a ruler or micrometer and that its accurate to 0.5mm. You are now ready to fill the fuel bowls. So flick on the pump...Wait for 20seconds. Flick it off, look down inside the barrel into the venturi, if you can see fuel dripping from the venturi the bowl has a bit too much fuel in or you valve is worn if they were not new or you got ripped off with some crap kits from EBAY. No biggy if the valves are new and good, you will be adjusting and checking it anyway. Now you need to remove the top plate and use the depth gauge part of the caliper. NOW ITS VERY IMPORTANT TO DO AS I SAY! Fuel level setting is VERY IMPORTANT AND IS 27mm from the top face of the carb body down to the fuel. Pump is off, if not turn it off!!! 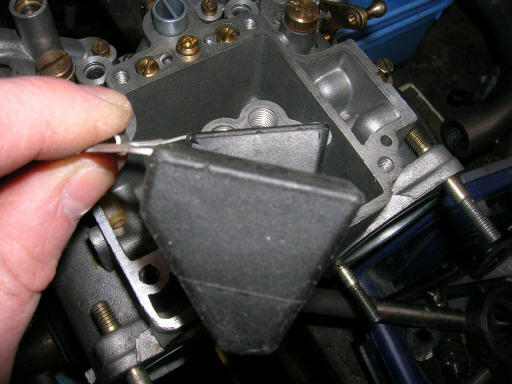 Wait for a minute for pressure to fall BEFORE removing the carburettor top. Work on one carb at once. 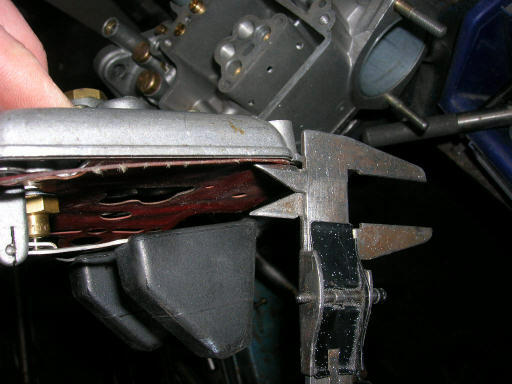 If the fuel lines are not flexible it may help to remove them from the carb you are working on. 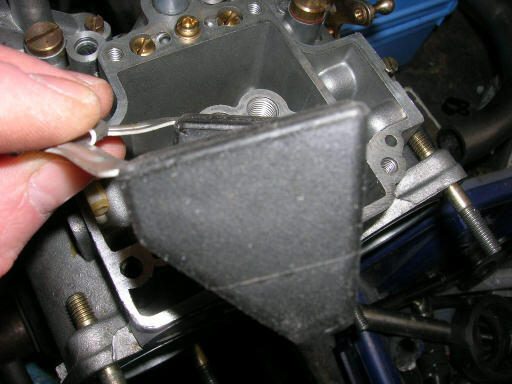 Put your one hand spanning the top of the carburettor top, float cover and put on some decent downward force with your fingers at each corner. Now undo the two screws...Remove them. 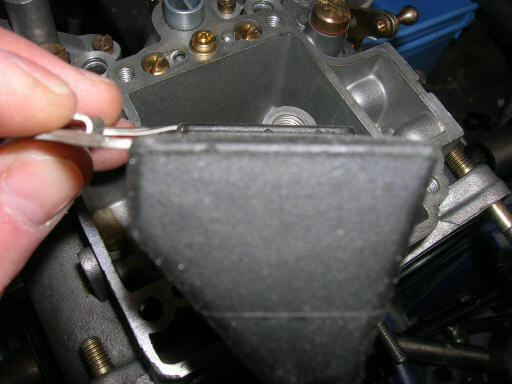 Drop the screwdriver and quickly (under 1second) whip off the float cover/carburettor top and move it to oneside. You need to do this quickly before the float drops and more fuel is dribbled into the bowl when you raise the top away from the body. You now have the fuel exposed. 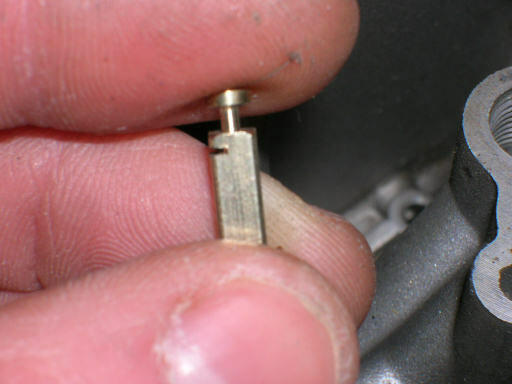 Get the depth caliper in position as shown below. About 3mm off the wall of the central tower, at the back of the jet stack...Not at the edge or running down the wall as the liquid will radius here, but slightly away from the jet stack. The tip of the depth measure should just make contact with the fuel. If its too high and the tip is well into the liquid, maybe use the container the valve came in to bail out some fuel, a good amount. (wear gloves! Yuck!). If too low, read on. Below shows an unadjusted float. Fuel level too low, tweak up the end of the float, as shown below. (this is a dramatisation! Do not tweak as much as this!!!) a millimetre or 0.040" at time. If the bowl is 2mm low, go up 2mm on the float! Fuel level too high and venturi leaks? Tweak it down as needed. If you have brought VITON Valves I recommend ONLY using them. They can "plump" up a bit after being exposed to fuel for the first time, so leave them to soak in some fuel for alteast 1hr before fitting them and calibrating fuel levels. I have some stock of OE spec Kits or http://www.dellorto.co.uk can supply. 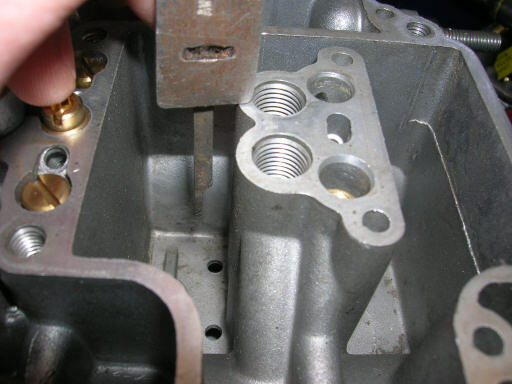 You can do the above adjustment with the carb top on by removing the main jets and jet cover from the carburettor and sticking the depth probe down main jet stack hole, but its hard to see etc chances are you will need to make some adjustment and remove the top anyway. Ebay KITS ARE JUNK. Bar some RCA Ricambi Kits...Its RCA or OE Dellorto or NOTHING! Hope this helps demystifty something so simple! Although I prefer my old Webers, (Sorry Dave), I must compliment you on a first class technical posting! Thanks for this Dave you are a generous fellow, that caliper is Noah's I believe my digital one would give error the second it got near fluid so yours is perfect. Prikol! But russian letters are here displayed not it is correct! Toy Boy. Best to make a new thread on this stuff. I missed the question. No problemo. More info, Car, Jetting, Type of DHLA. You have adjusted the idle screws? The carbs are balanced? Airbleeds are fully in and set evenly? Full droop settings also must be 27mm ? How do you tell the difference between Viton needles and regular ones? Viton have a rubber tip (red) and metal have a metal tip. Rare to see Vitons in anything bar OE spec Lotus carbs. The dodgy ebay set I picked up was meant to be equipped with new Viton valves. Considering the floats were also setup correctly I'm very much tempted to stick with them rather than use the decent set I got from Dellorto.co.uk. Pull the float pin and look. 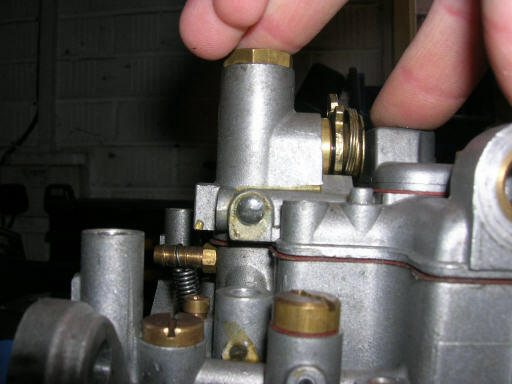 The needle valve is the most important component in the carb, followed by the pump diapragm. Oddly these are the two items that are usually completely badly made in reprokits and the carbs never work using repro. Only one company makes "useable" repro kits, that is RCA Ricambi in Milano. Is it possible to let me know best set up for my DHLA 40H jets, air, idle, idle holder, tubes, chokes, ventur etc to suit my engine please? 6 tube is for non-emission. You have H model from 1800-2000cc, they should have 58idle, 11 tube, 148main? In that case you just need some 60idle jets. Simply obtain some 60 idle jets and some 190 air correctors and you should find the carbs ok.
Don't change the idle jet holder to a 7850.? Stay with the unmarked holder. You might find no tuning needed at all, mild cam, 1700. It's ok to use them as they are, I suggest some 190 air correctors so you can bring the main-jet down a little if there is any lean miss crusing in the mid range. They come from 1800cc 8V with good exhaust and mild-yet ok cams. They should be fine, there was an airbox on the Alfa so a larger depression on the jets, so thats why you need a larger idle and smaller air corrector. Maybe get some 144 main jets too. With this set up it was working fine at low revs but at high revs it was not developing all the power. It will rev 6000, when before with other carbs it revs 8500! At the moment I upgraded to 34mm chokes and came worst than it was as now with 3000 revs, will not take any more gas, like pulling back and some sneezing. Check float level, replace needle/fuel valves if needed and setup fuel level. Sounds lean, shouldn't be lean on a 148 main, suggests you have low fuel level. Get the basics correct before you worry about the jets. If still lean use a 155-160main jet. Hi DAve, floats are 8.5gram and level 14.5mm. Are they good? There is quite a few megajolted cars on this forum. 14.5mm means nothing, are the fuel LEVELS set correctly? Hi Dave, after a week trying different jets chokes etc, I still have a flat spot at 4000revs. After that, it flies!! What do you think its the problem please? Must be too rich or to lean, obvious answer, you need to find out which I don't have a crystal ball, sorry! I cant tell you how useful this was in setting my MG up......the float level was the final piece in the jigsaw for setting them up right.